I do not have iPhone and iPad, but today my subject is an application for iPhone. I just think may some people will be interesting about it. 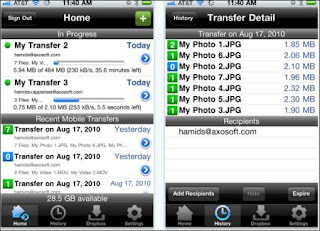 Transfer Big Files is an application for iPhone that lets users share big files with other users like image, video wirelessly. Transfer directly from your iPhone without having to plug in to a computer, then share it with anyone using a web link to the download page. Actually, your photos and videos are transferred to your Transfer Big Files cloud storage. You can get a download link in an email, users can send it to other users who can download files directly. Transfer Big Files offers 5GB space for free now. It compatible with iPhone, iPod touch, and iPad. Requires iPhone OS 3.0 or later.